The “Berd” is an ancient word that stands for a fortress or prison. The goal of the game is to collect the most tokens of any color by the end of the game. The game consists of a playing board, a pair of dice, and attachable tokens of different colors. Playing pieces in the Berd game have ability to attach/detach to each other. Using interlocking blocks players can create towers and a certain type of tower – Berd has unique properties that make this game special. Each player plays with his/her color tokens. Players move their tokens by counting squares on the board according to the numbers they rolled on the dice. Players start from one of four corner squares, go around the board in clockwise direction and finish at the same corner they started. On the path players can capture opponent’s tokens. Players can create Berd(s) for protecting their tokens and blocking opponents’ move. Number of players in this game can be from 2 -16. Playing time is vary depending on number of players and number of tokens played. A most common 4 player basic game lasts about 35 minutes. At the beginning of the game players choose color of tokens they will play. All players will get equal number of tokens. Then players throw one die for determining who will select the starting/finishing corner the first. The highest scored player will select his/her starting corner the first. Other players will follow in descending order placing stack of their tokens on any starting corner they want. Players can start from the same corner. The highest scored player will start the game following by other players in clockwise direction. Tower – a stack of 2 or more tokens (any color). The color of the token on top represents who owns that tower. Berd – two or more tokens of the same color stacked on each other on the top of a tower. A Berd is considered a protected tower. 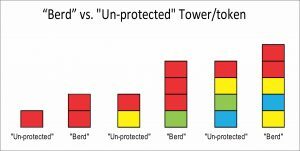 UT – Unprotected Token/Tower => a single token or a tower which is not a Berd. An unprotected tower moves like a single token. Double – when you roll the same number on each die. In this case, you are to play the number 4 times. Active Token – a token is still on the board that hasn’t been captured. Inactive token — a token captured in a tower or Berd by other color token. 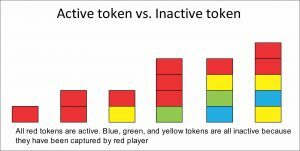 Inactive tokens always stacked under the active tokens. Active Player – a player who still has active token(s). Recovering inactive token – a player can recover his/her inactive token(s), captured in an unprotected tower, by landing on that tower. In this case the player will create a Berd by restacking his/her tokens on the top. Players roll a pair of dice and move UTs (unprotected tokens/towers) on the board by counting squares in the clockwise direction. You can play with one UT both scores of the dice, or play each value of the die by different UT. You must move an unprotected tower like a single unit with captured tokens attached underneath of your token. Players will capture opponent’s UT when land on them. However, you can’t capture a Berd and you can’t land on a square occupied by the Berd. If you capture an unprotected tower that contains your color token(s) inside, then you will restack the whole tower and put your color tokens on the top, creating a Berd. There is no limit of capturing other tokens. However, if you create a Berd, you cannot move it whole. You have to split up your Berd and play token(s) or unprotected tower(s) from your Berd separately. If your Berd contains captured tokens, they must be attached to at least one of your tokens whether moving or staying. You can split captured tokens in any combination when splitting your Berd but they must be attached under your token(s). When you roll a double, you will play the scored points four times. That is a great advantage especially with Berd because you can move two or more tokens simultaneously, so they will remain protected. When a player finishes his/her token by reaching the starting corner, this player will collect one token from each active player. In order to finish, you don’t have to land exactly on the corner square that you started from; you can go over. Other players should decide what color and from where to give a token to the finished player. They can give any token in their possession, whether from the board or from already finished tokens. When finishing, you only get tokens based on how many of your own color tokens finished. The game is over when only one active player remains. The winner is the player who collected the most tokens of any color. Tokens left on the board are not counted. You can just stack all your collected tokens and compare to see whose tower is taller.